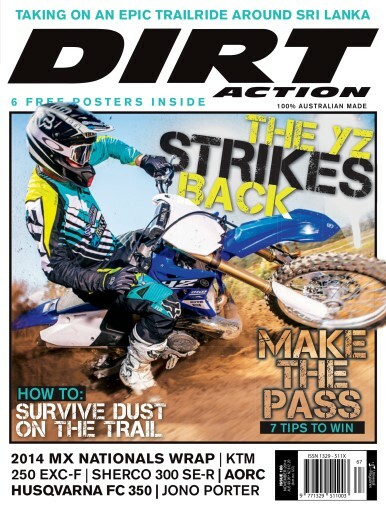 In DIRT ACTION issue 186, we test Yamaha’s 2015 model YZ two-stroke range. A full day blasting oil burners around a prepped track…can it get any better? The 2014 Monster Energy Motocross Nationals have come to an end and three champions were crowned – we were the for all the sandy action at Coolum. We test Sherco’s amazing new 300 SER two-strike. This could be the bike of the year! We also test the KTM250EXC-F and Husqvarna’s FC350. Ride around Sri Lanka a tribute to Jono Porter and an AORC wrap-up are just a taste of the goodies in amongst these pages.